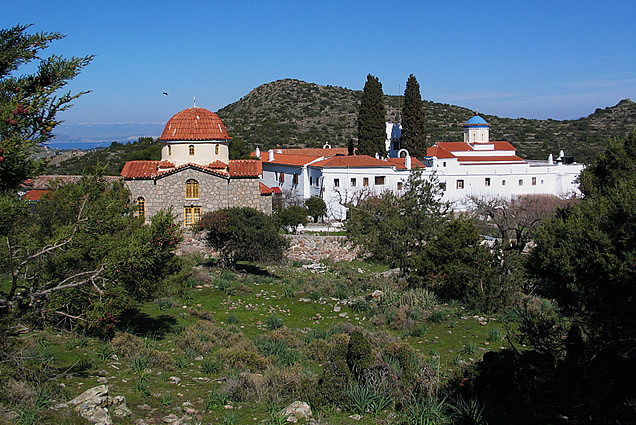 One of Aegina's best-kept secrets is this beautiful early 17th-century fortified monastery which sits off in the hills of central Aegina on a high plateau, quite by itself within the bosom of nature, inhabited by only nine nuns and quite a few animals. 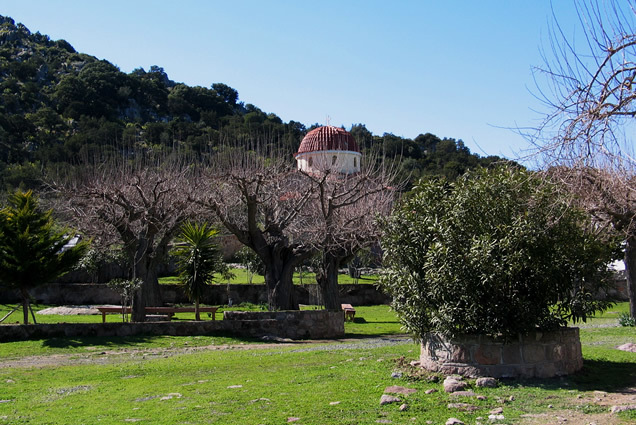 A 30/45-minute walk up a long road that starts across from the better-known (and far more frequented) Church and Monastery of Agios Nektarios. 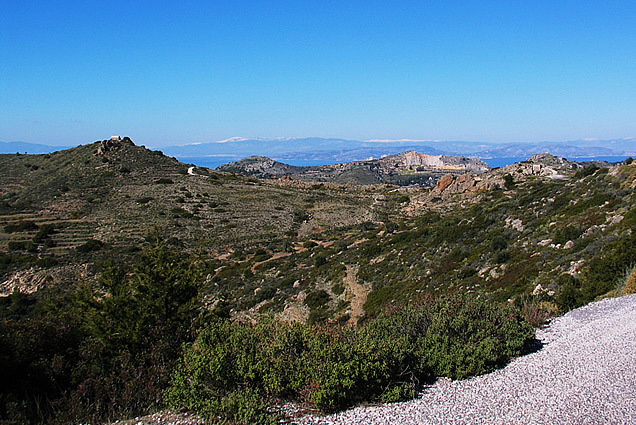 Chrysoleontissa is a delight to hike to, especially on a sunny day, with spectacular views all along the way. 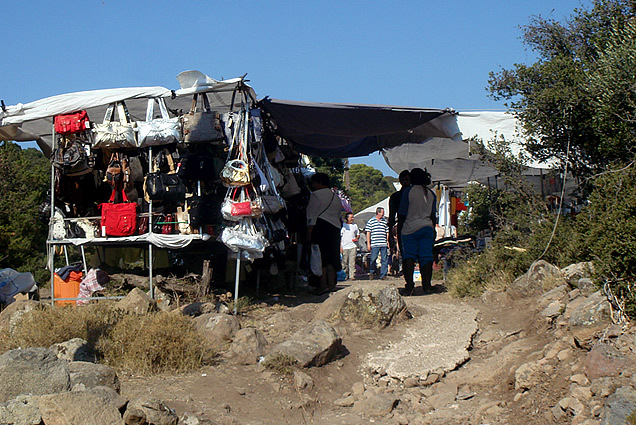 It can also be reached via footpaths from the village of Pachia Rachi (above Marathonas on the island's west coast). 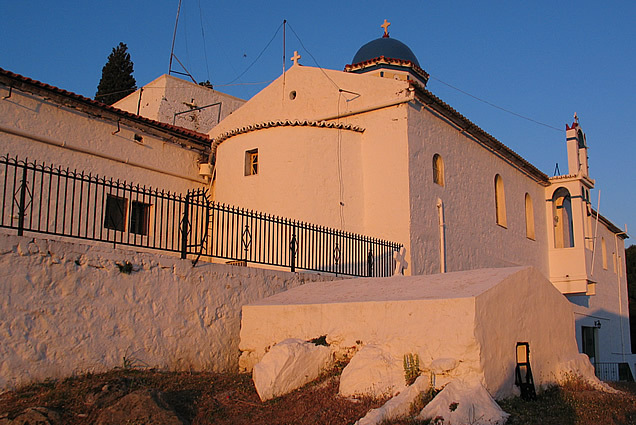 If one approaches the monastery from the long road that winds uphill across from the Agios Nektarios complex, one eventually passes a shrine by the side of the road with a continually burning oil lamp. 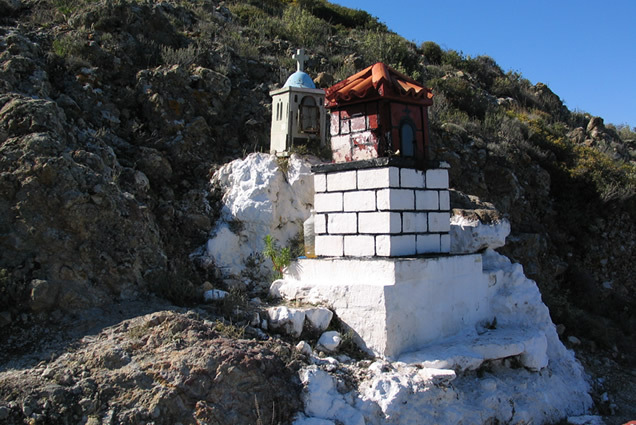 This is where the Panagia Chrysoleontissa (Virgin Mary of the Golden Lioness) was said to have leaned against the rocks embedded in the nearby slope as she stopped to rest. 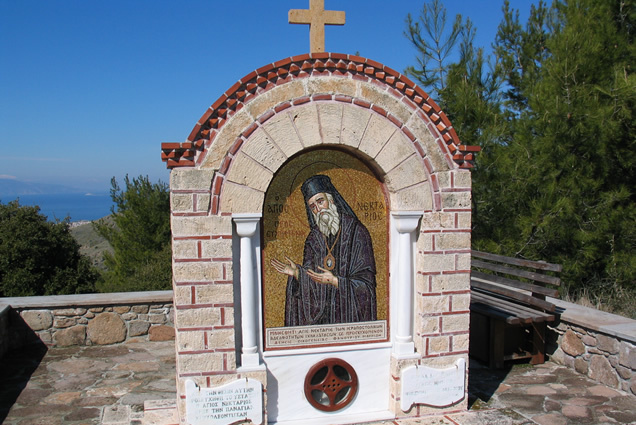 A second shrine marks the place where Agios Nektarios is said to have done the same, with a wooden seat making it possible for modern day visitors to sit and enjoy the fine views of steep slopes all around, the sea in the distance and mainland Attica beyond. 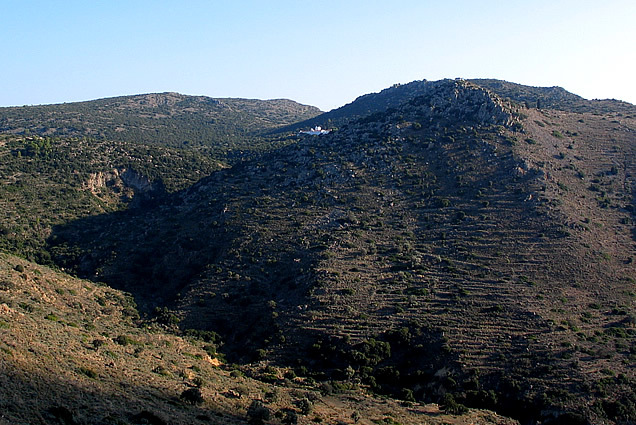 The dominant visual impression of Chrysoleontissa, especially when first glimpsed from the slopes above it on the paths coming from the village of Pachia Rachi, is that of the long oblong building with its high whitewashed walls and orange-tiled roof - rather surprising amid the surrounding rocky landscape (lovely in spring with vibrant green grasses amid the rocks after the winter rains). 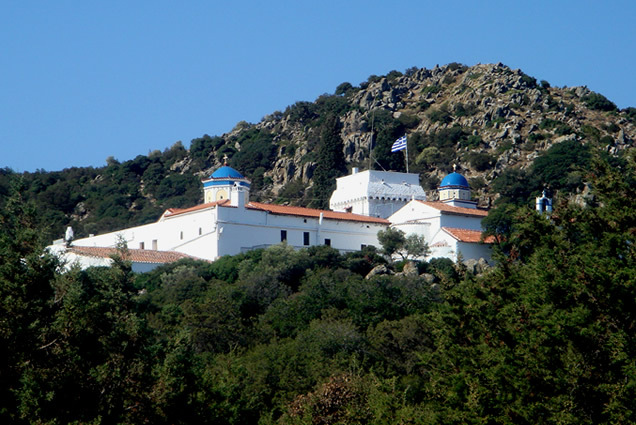 Looking closer, one notes the tall white square tower jutting up above the roof of the building and the blue dome of the church near it. 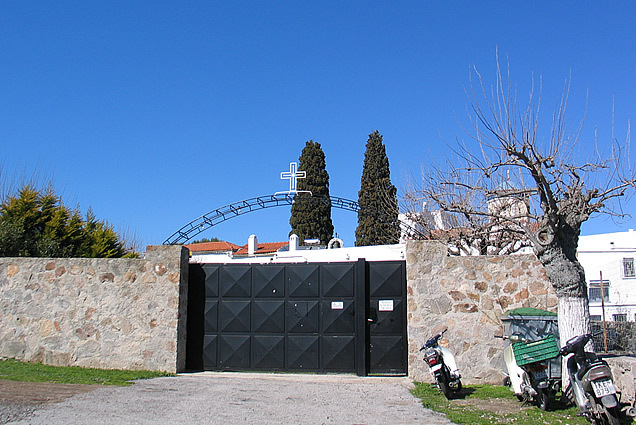 Εntrance is via a tall black metal gate, and once within the monastery grounds, the peacefulness of the place envelops the visitor. 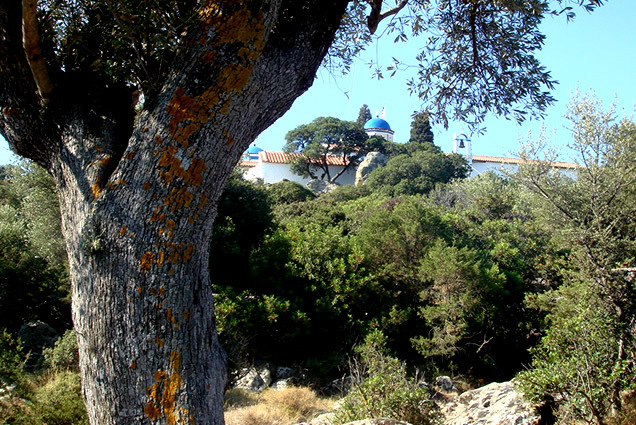 There are wide-canopied oak trees - a rare sight on the island - and sheep that wander freely, large bells around their necks. 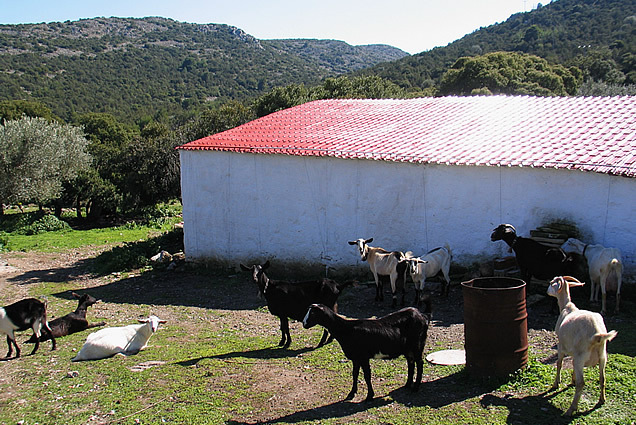 Goats bleat cheerily nearby. 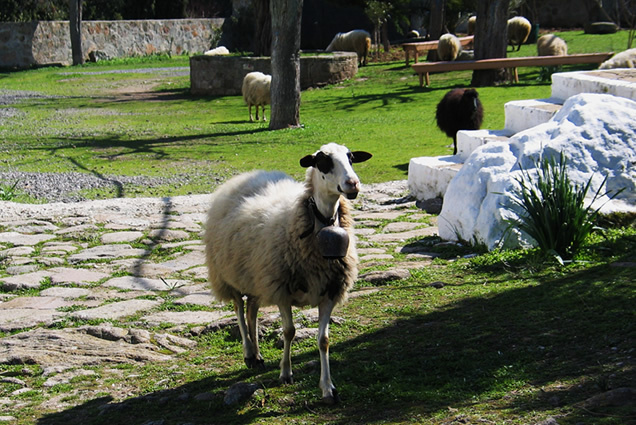 We saw many kids frolicking within the goat pen, beyond which are large pens for peacocks and the fenced and walled ostrich yard. A fluffy dog watched us from its little house under an oak tree as we strolled around, enjoying this idyllic scene on this lovely spring day in early March. 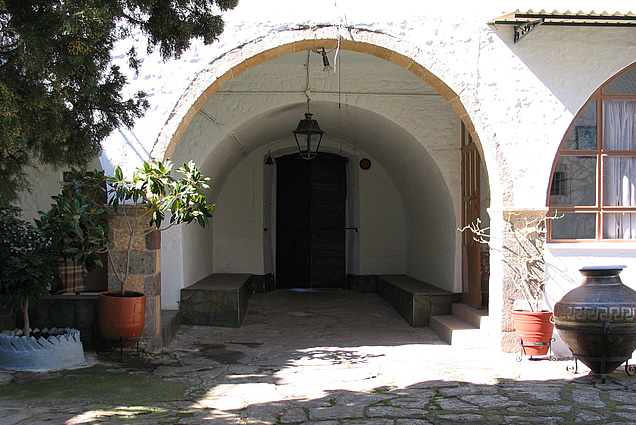 Passing through the large arched entrance into the building, one finds oneself in a courtyard with two fine tall, conical cypress trees, one of them with a very thick trunk, the other younger and far more slender. 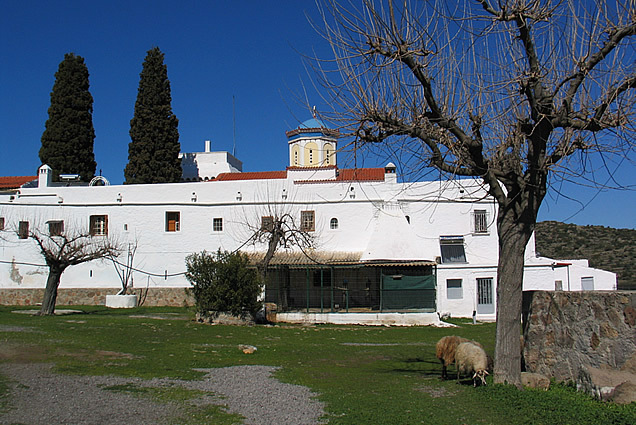 On three sides, there are two-storey buildings with cells for the nuns (formerly for monks), as well as guest rooms and auxiliary rooms, and on the fourth side, across from the entrance, the church, next to which is the 20-metre (66 foot) defense tower, built in 1403, its wooden shutters all closed, with doves going in and out of the loop-like decorations below the tops of the high walls, and marble heads on the four corners of the flat roof. 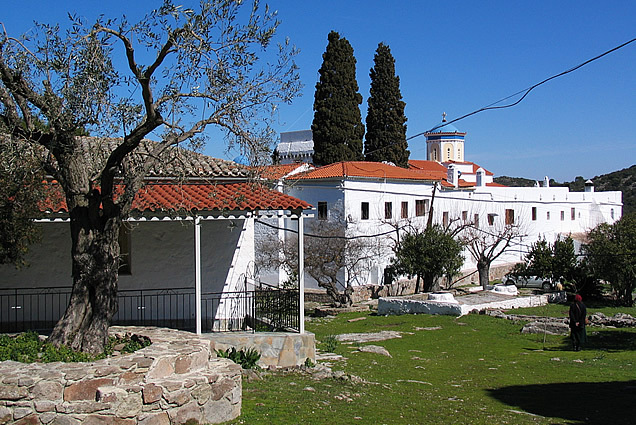 The interview for this article with the Igoumeni (the Orthodox equivalent of Mother Superior) was held inside the church, which was built in 1808, replacing an earlier one that burned down. 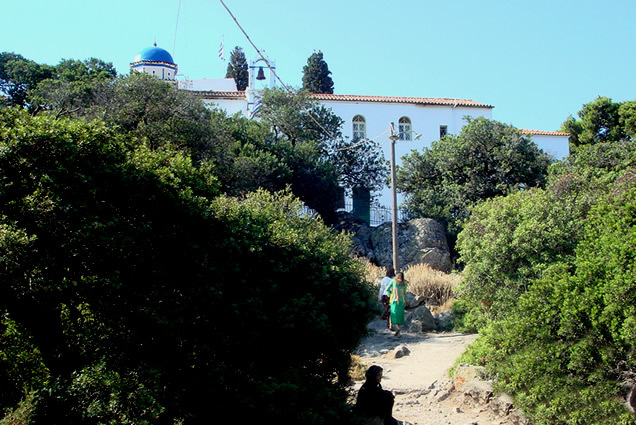 Local tradition has it that the original monastery was located near the sea at Agios Leontios, near Souvala, and was destroyed by pirates, the monks retreating to the Dendros mountain in the central part of the island, taking with them the miracle-working icon of the Panagia. 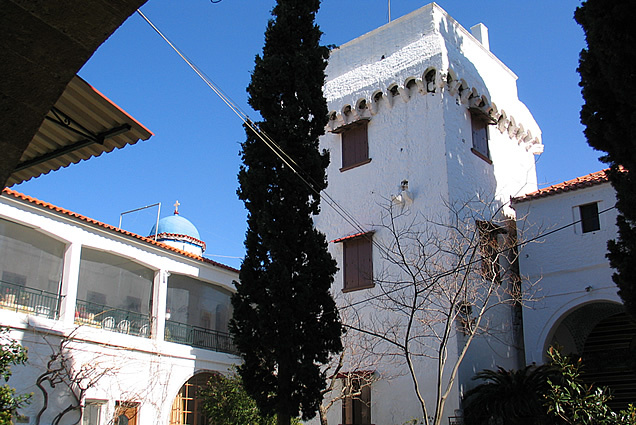 The monastery was built sometime between 1600-1614, when Greece was under Ottoman rule, on the foundations of an earlier monastery built in 1403 (along with the tower), by Emperor Heraclius, during a period of Catalan rule. 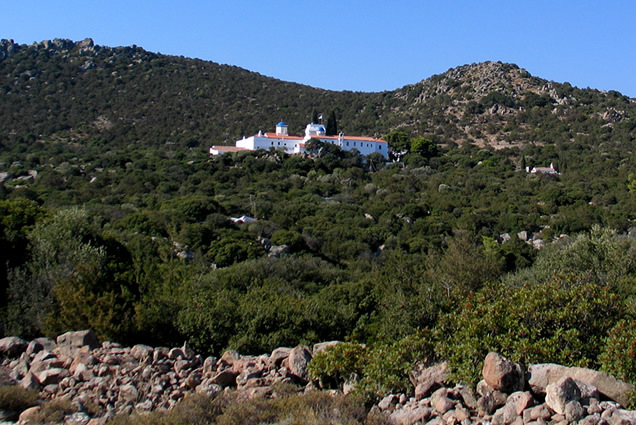 The monastery was once very wealthy, owning ¾ of the island, along with some uninhabited smaller islands, but its holdings were expropriated during the 19th century and the monks had to abandon it. 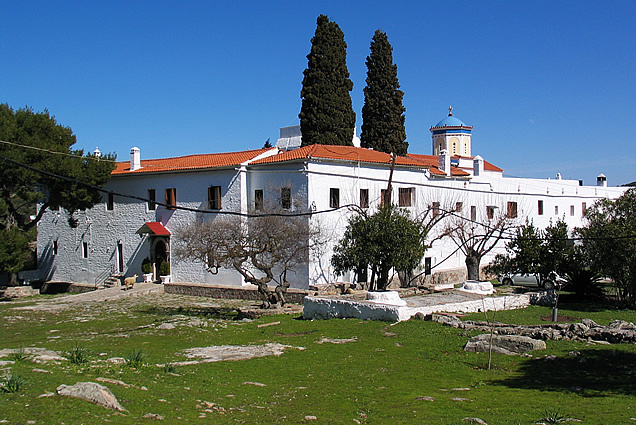 In 1935, nuns moved there from Agios Nektarios and Panagia Chrysoleontissa began functioning as a nunnery. 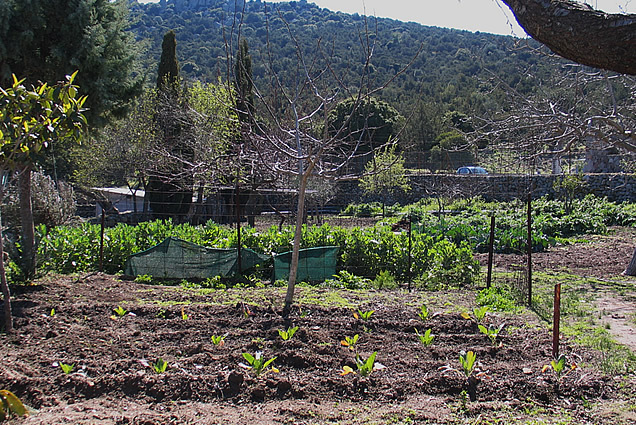 The Igoumeni (who did not feel it important to give her name), told us that she had been living at the monastery for 58 years, from the age of 11. 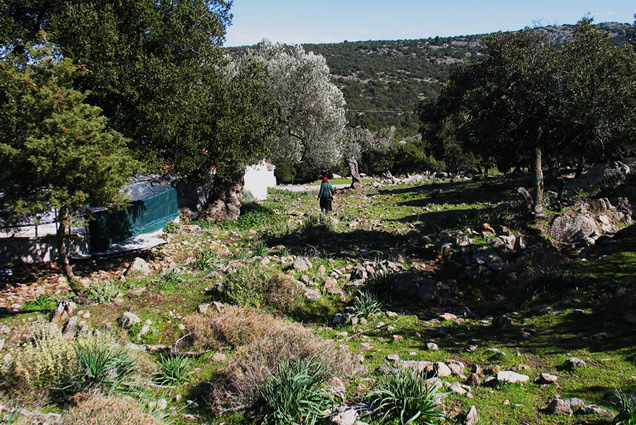 Her family lived in Aegina's Kipseli area, and she ran away from home many times (the police coming after her to take her home), before she was finally allowed to follow her heart and stay. From the monastery she walked 1 ½ hours each way to and from the school in Pachia Rachi village (3 hours per school day), where she was one of 60-70 children, with one teacher. 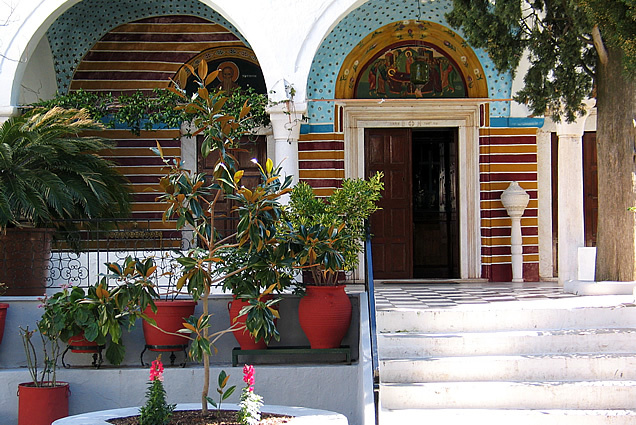 There are 9 nuns at Chrysoleontissa, she told us, some with pensions, other support for the monastery coming from donations - one benefactor making a gift of central heating. 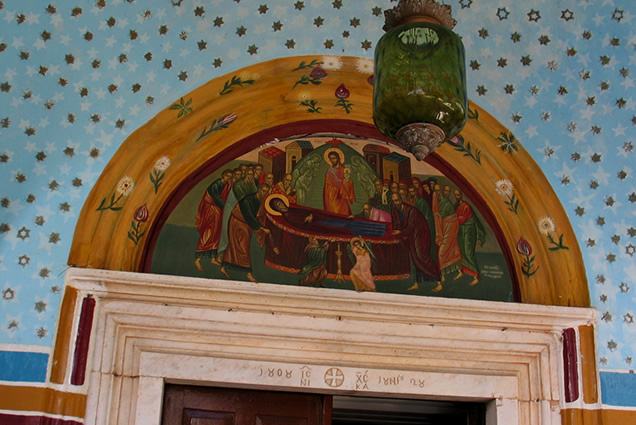 The Igoumeni pointed to an inconspicuous radiator on one of the church walls. 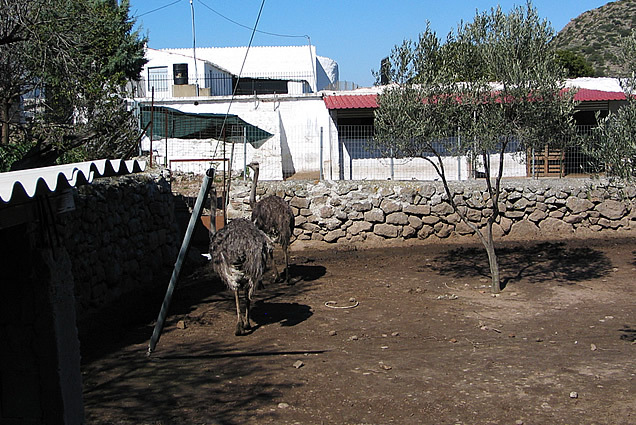 For food there are ostrich eggs from the three ostriches, and (we assumed) meat from the sheep and goats, and vegetables from the garden. Some of the ostrich eggs had been painted by one of the nuns (an iconpainter), and decorated the rim of a candelabra in the church. 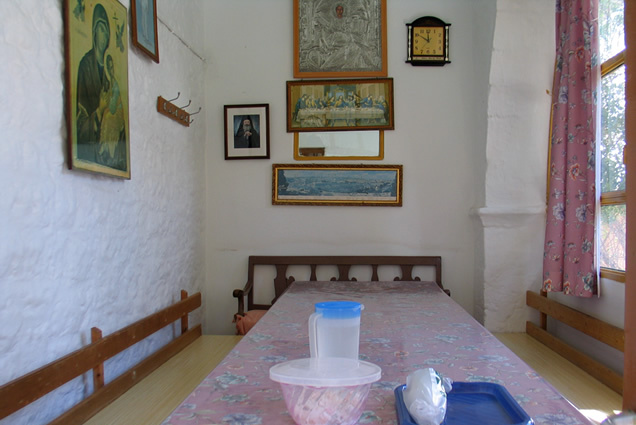 The sisters arise at 4:00 am daily, and spend three hours, from 5:00-8:00 in church liturgy and prayer, with breakfast at 8:00, chores, daily work, a meal at midday, and maybe some time spent in their cells afterward. 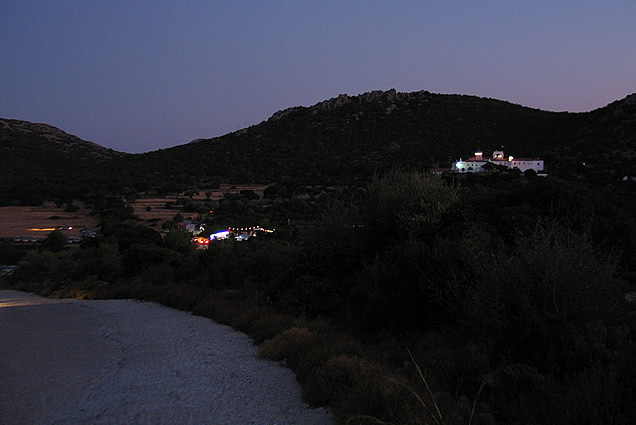 Evening services occur between 17:00-19:30, followed by sleep. When asked if the nuns ever read newspapers, the Igoumenissa replied, "Why would they want to fill their minds with worldly matters when it is such a joy to occupy oneself only with God?? Not that all are chosen for this path…" she added. 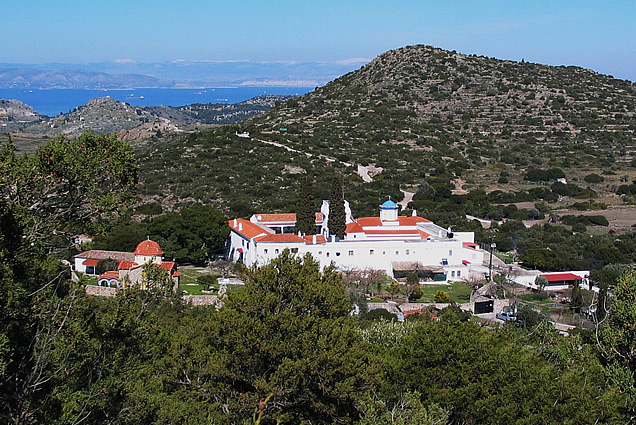 "Does the monastery have any connection with the rest of the island and its community?" She showed us the intricate carvings on the dark wood of the icon screen in the church, made in 1670, which illustrate Biblical tales. 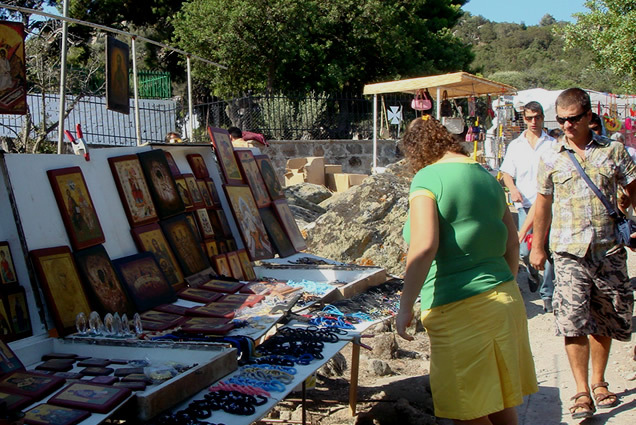 She showed us the silver miracle-working icon of the Panagia, and told us how much Agios Nektarios had loved it, and of how he had visited the monastery. 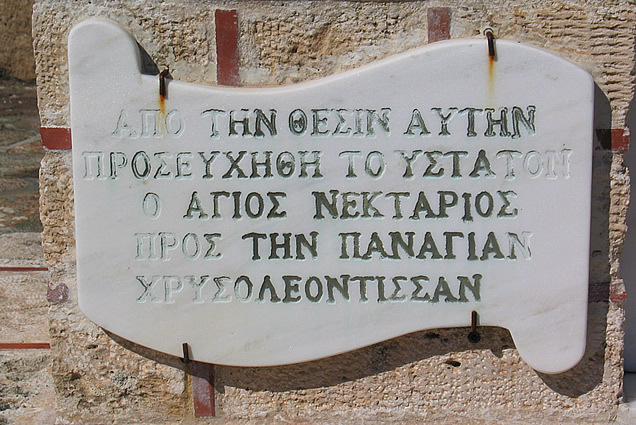 "Others came too, from Aegina, seeking cures for illnesses. "Women who were infertile came and asked for help and afterward soon became pregnant." 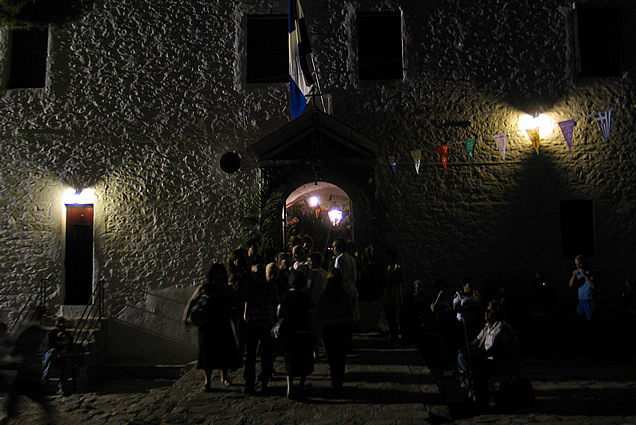 She told us too how the monks had poured hot oil on pirates from the corners at the top of the tower roof. 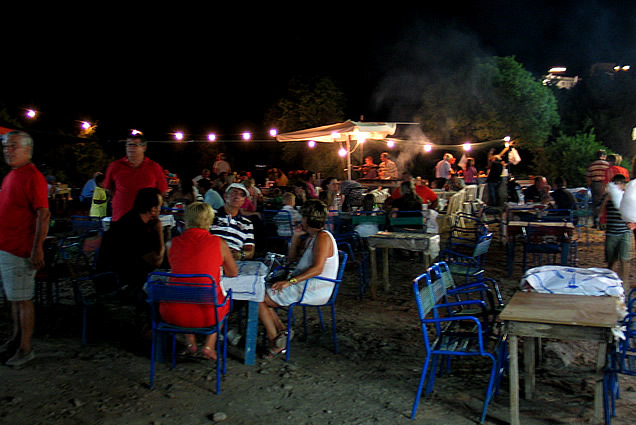 "Do many visitors come here in summer?" "Not so many. 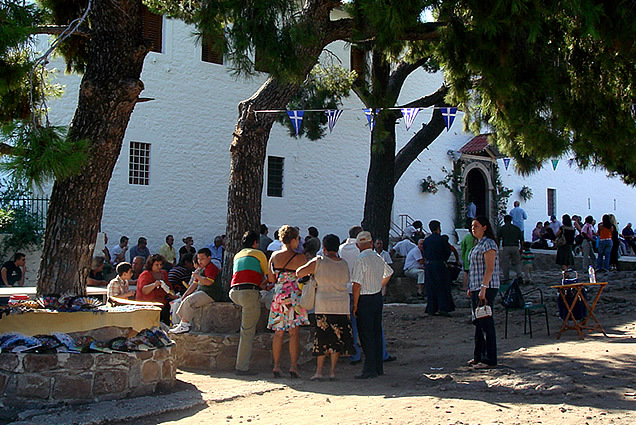 All those busses bring people to the Agios Nektarios church and monastery. We're hidden up here…." 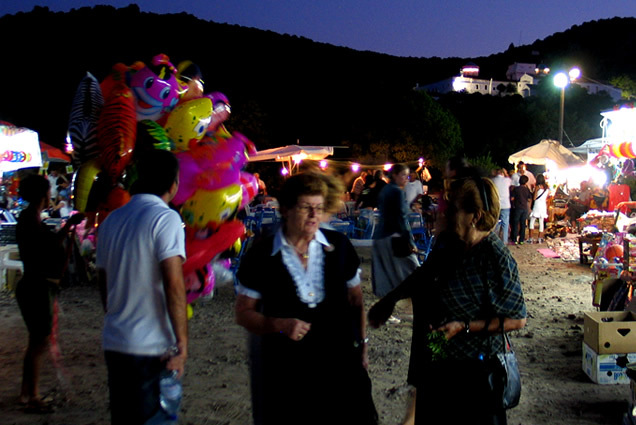 People do still come, however, on the eorti (name-day) of the monastery: on the 15th of August (Dekapendavgousto), the Dormition of the Virgin Mary - a major celebration all over Greece, due to the plethora of churches, chapels and monasteries dedicated to the Panagia/ Virgin Mary. 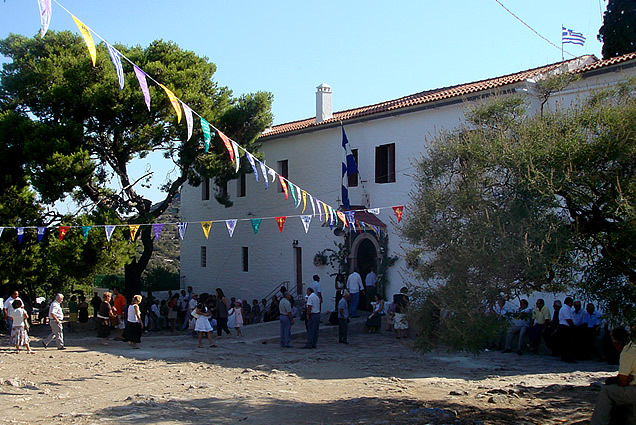 In the past, people would come to Chrysoleontissa the evening before by foot or donkey and stay up all night, the men camping outside and the nuns and women within, to rise on this special day for church services, followed by feasting. In recent years, the custom has changed somewhat with people coming up by car. 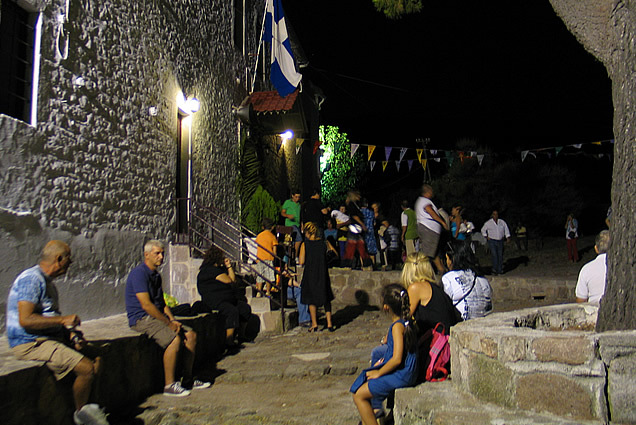 There are church services from 21:00-3:00 the evening before, and from 7:00-10:00 in the morning, with the panegiri (saint's day celebration) following at midday, with a huge table outdoors and a lamb roast provided by the monastery. "No. Only psalms. Churches have music at a panegiri, not monasteries." 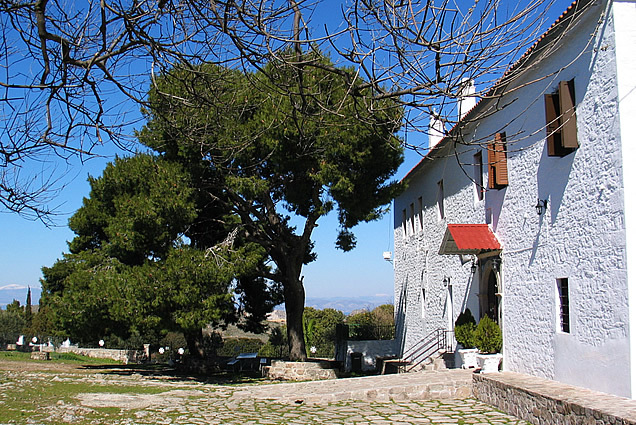 There's a guest house on the premises, within view of the main building, and guests wanting to spend the night at the monastery are asked to phone at least two days ahead of time for a stay of up to 24 hours. Daytime visitors are also welcome, but not between 2-4 pm.